Two days ago a Boeing 787 Dreamliner operated by All Nippon Airways (ANA) was flying to Tokyo when smoke was detected directly beneath the cockpit. The plane’s computers alerted pilots to the source of the smoke — the lithium-ion batteries in the front cargo compartment — and the aircraft made an emergency landing at Takamatsu regional airport. The escape chutes were deployed and all 137 passengers and crew walked away from the plane unscathed. 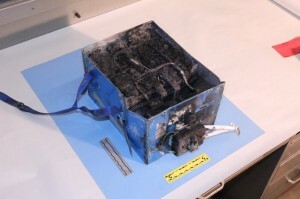 A burnt out lithium-ion battery removed from a Dreamliner. Copyright Reuters. The reaction was swift. Both ANA and Japan Airlines grounded their fleet of 24 Dreamliners, almost half of those in worldwide service. The European Aviation Safety Agency and the Federal Aviation Administration (FAA) immediately followed suit. “There is hardly a worse emergency to have than a battery overheat in a plane,” said Rob Mark, a pilot, who added: “It means you have to get on the ground, right now. The FAA has done the correct thing.” For Boeing, its problems with the batteries could prove to be a financial disaster. 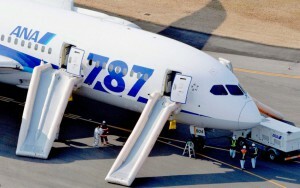 The manufacturer spent an estimated $32 billion developing the Dreamliner which it sells for $244 million. It has delivered 50 of the planes so far and has a pipeline of more than 800 additional orders. Built with advanced composite materials, such as carbon fibre reinforced plastic, the Dreamliners use 20% less fuel than existing aircraft. The plane’s electrical system is powered by lithium-ion batteries which have never before been used on passenger jets. The plane needs such large energy-storage cells because Boeing engineers in Seattle re-designed control systems to be powered electrically rather than hydraulically. It was all about saving weight. All 137 passengers and crew used the emergency chutes to escape. Copyright Reuters. Jim McNerney, CEO of Boeing, said “We deeply regret the impact that recent events have had on the operating schedules of our customers and the inconvenience to them and their passengers. We are confident the 787 is safe and we stand behind its overall integrity.” However, the FAA is determined to revamp the entire certification process and has announced that no US airlines will be allowed to fly the Dreamliner until Boeing can prove the batteries are safe. What are the lessons for us in the medical device industry? We have to follow two important standards, ISO 13485 and ISO 14971, that require us to analyse, evaluate, monitor and control risk. This occurs whenever a new device is being developed and continues through to post-market surveillance after the product is in use. Risk can never be eliminated but it can be mitigated.